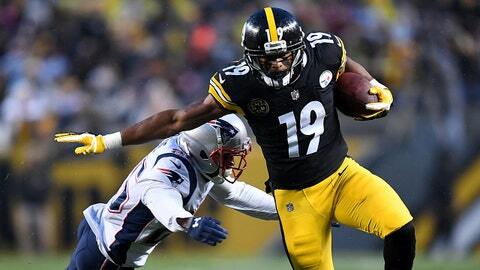 PITTSBURGH (AP) — JuJu Smith-Schuster wants to get something straight. That 4.52-second 40-yard dash the Pittsburgh Steelers wide receiver ran at the combine in the spring of 2017? It was a blessing, even if it didn’t feel like it at the time. A fraction faster and Smith-Schuster knows he likely goes higher than the 62nd overall pick in the draft and the chance to catch passes from Ben Roethlisberger and learn alongside Antonio Brown on a team with perennial and legitimate Super Bowl aspirations never materializes. So if Smith-Schuster had to wear the label of being “slow” for a few weeks, so be it. It’s kind of hard to miss. The 22-year-old leads the Steelers (7-3-1) in receptions (77) and yards receiving (1,055) heading into Sunday’s visit from the Los Angeles Chargers (8-3), including a 97-yard catch-and-run for a score last week against Denver, tying his own record for the longest grab in franchise history set last year against Detroit. Smith-Schuster ran underneath a rainbow from Roethlisberger, pulled away from Chris Harris Jr. and stiff-armed Darian Stewart to the ground with one thought running through his mind. “Every time I break away with those (long) touchdowns I always say . I’m not going to say the word, but I always say ‘Combine, what? What was the combine for? '” Smith-Schuster said. Though Smith-Schuster’s enthusiastic and decidedly physical approach to blocking — one head coach Mike Tomlin likened to former Steelers wide receiver Hines Ward — initially earned him the respect of his teammates as a rookie, he’s spent most of his second season becoming more than just a complement to Brown but a legitimate and dependable big-time threat in his own right. When the Steelers were desperately trying to rally from a 16-point deficit in Jacksonville two weeks ago, Smith-Schuster’s leaping 35-yard grab down the sideline on Pittsburgh’s final drive helped set up the game-winning touchdown. It was the same against the Broncos. Roethlisberger hit Smith-Schuster for a pair of 19-yard gains on the Steelers’ last possession and on first-and-goal at the Denver 3, Roethlisberger didn’t look to Brown but to Smith-Schuster. The pass to the corner of the end zone was too long, and two plays later Roethlisberger was intercepted in the end zone while trying to thread a pass to Brown. After the 24-17 loss the quarterback admitted he wished he’d looked for Smith-Schuster on every snap and chastised Brown for running the wrong route, suggesting the “WiFi” connection — Brown’s description for his relationship with Roethlisberger — between one of the most productive quarterback/receiver combinations in NFL history is on the fritz. Smith-Schuster understands it lends itself to an easy narrative that the torch is in the process of being passed. He insists that’s hardly the case. It’s Brown, not Smith-Schuster, frequently drawing double teams. It’s Brown, not Smith-Schuster, who remains Roethlisberger’s favorite target. And it’s Brown — who is co-starring with Smith-Schuster in a series of Pizza Hut commercials — who is on a potentially Hall of Fame career path. And in the present. The 30-year-old Brown is on pace to extend his NFL-record streak of consecutive seasons with at least 100 receptions to six even with the increased attention from opposing defenses. While Smith-Schuster allows he plays a position known for producing divas, he has no plans on becoming one creating any sort of “me or him” scenario with Brown. The only goal by which every season in Pittsburgh is measured. The Steelers lead the AFC North heading into December and are on track for a fifth straight playoff berth. Yet Pittsburgh hasn’t reached the Super Bowl since 2010 and while Smith-Schuster is all for expanding his “global brand” — look no further than his rapidly rising endorsement deals or his forever busy Instagram page for proof — he knows all the yards, all the touchdowns and GIF-able celebrations that ensue won’t amount to much if the Steelers don’t reach the Super Bowl. “All of this doesn’t matter if you don’t win it all,” he said. Something Pittsburgh can do if Brown and Smith-Schuster continue to develop into arguably the best wide receiver combination in the league. They’re getting close if they’re not already there, and they know it.